More often that not, the humble hallway is the first room of the house that visitors see. Yet so many people overlook the potential that a hallway has to create a striking first impression. Whether you’re fortunate enough to have a grand hallway with endless amounts of space or something a little narrower, you have plenty of options to make the most of the space. We’ve said it before and we’ll say it again, a bespoke staircase can become a great focal point to transform your hallway into the heart of the home. Most of the time, a hallway is simply seen as a way to get to all the rooms in your house, but with a bit of creativity, it can become far more than that. The hallway has the possibility to become another room in your house if you think carefully about the layout. From a small study area to a music room it can be anything you want it to be. 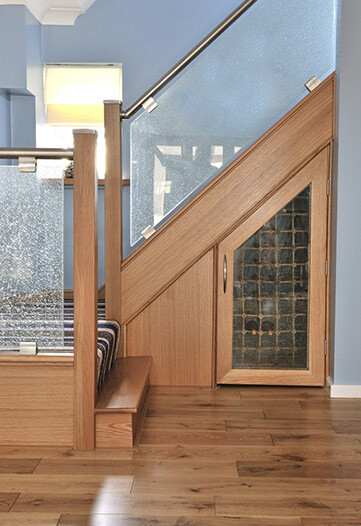 At Jarrods, we’ve created staircases that allow hallways to serve their own purpose as a second room by utilising clever storage options and optimising space. In our eyes, a staircase does more than connect the floors of a house; with a little imagination, it can become the key design feature of any room. 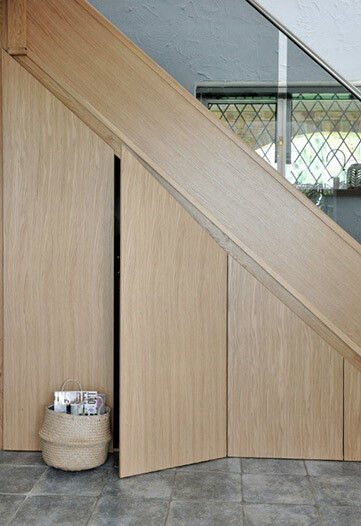 Clever storage solutions can be built into your bespoke staircase to really optimise space. This will leave you with more options on how to utilise your newly spacious hallway. You can even make a feature out of the under stair storage like Mr and Mrs Russell, who decided to create an under stair wine rack! 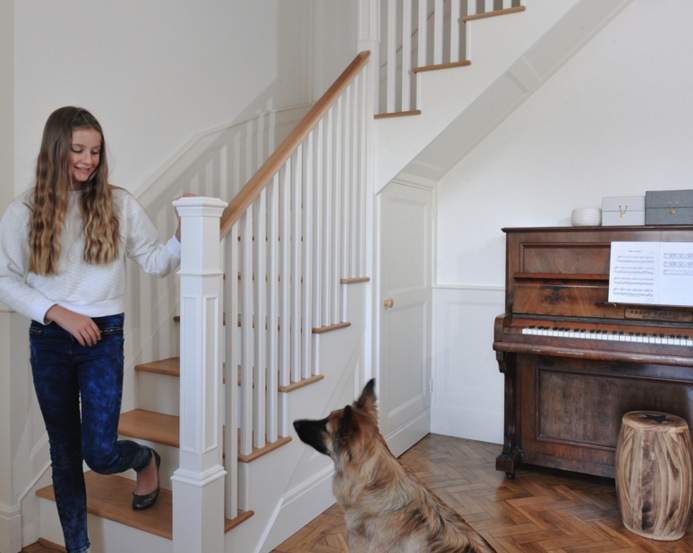 We’ve been in the staircase business for a long time so we’ve seen everything from traditional under stair cupboards to under stair dog house. As we always say, the only limit is your imagination. Sourcing the right materials plays a crucial role in creating the perfect staircase and making the most of the room. By using lighter materials or glass, you can create the illusion of more space in your hallway. Furthermore, by combining these materials with our clever approach to storage, you’ll give yourself far more options when it comes to making the most of your hallway. 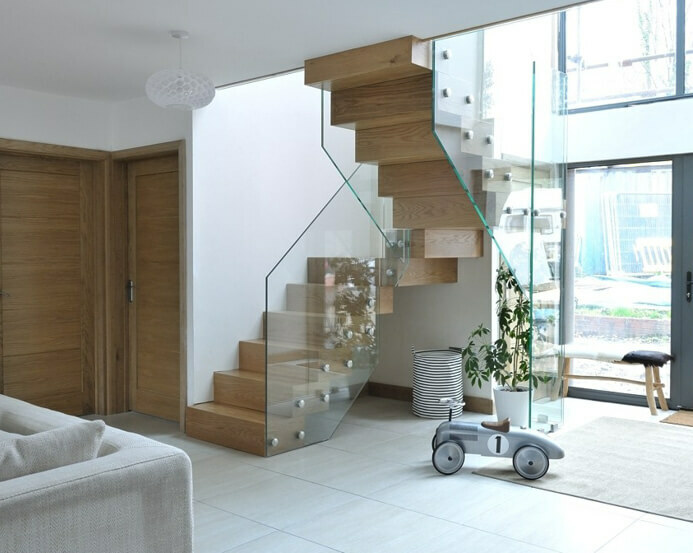 For example, mixing glass with traditional wood create contemporary staircases that truly maximise light in your home, making the entire room feel more spacious. If you want to transform your hallway into something more special, get in touch today to find out how a bespoke staircase might help.